La Trobe University in Victoria, Australia is home to 2,600 students living on its campus. At a school of over 35,000 total students, it means that these are the students that have actively chosen to take advantage of the benefits that residential campus life can offer. At La Trobe, this includes a variety of social and academic support, and the school has done its own research which proves living on campus increases students’ academic performance and overall academic engagement. Laura Burge, La Trobe’s Residential Education Manager, has led an initiative to provide the students living on campus a new tool that is serving to increase that engagement throughout the school year in the form of a mobile app. Laura, along with her office, works hard to communicate to the students the opportunities and activities that Residence Life (Residential Education in Australia) offers. Previously, this mainly consisted of a large online calendar of which Laura and her staff had no real way of tracking usage. Now, thanks to La Trobe’s branded app created with the help of GuidebookEDU, the students have access to a year-round wealth of information – a comprehensive schedule of activities and more. The “Live @ La Trobe” guide is putting important residential information at students’ fingertips in unprecedented ways. Students can actively seek out activities on an exhaustive calendar housed within the guide. The calendar is managed by Laura’s staff, and edits can be made easily – even when things change at the last minute. In addition to schedules, students can view important information from Residence Life’s four branches – Health and Wellbeing, Academic Excellence, Social Engagement and Community Standards – as well as campus maps, contact information and staff listings. Students can even create personal schedules based on the offerings from the master schedule. For Laura, encouraging the students to adopt the new technology was a deliberate, but uncomplicated, process. Getting first year students on board with the app proved easiest of all because La Trobe had also developed a Welcome Guide within its app that was already widely adopted by the incoming class. Students received a link to download the app via email when they were accepted, and it didn’t take much convincing on La Trobe’s part. Building the initial Welcome Guide was no small task due to its wealth of content, but Laura worked with one of Guidebook’s professional Guidebuilders, Isabel, to create a strong guide from the start. Laura was then able to use the first guide as a structure, cloning it within Guidebook’s CMS, saving a lot of time on future guides and allowing her to easily create updated guides each year. Laura has been eager to share her Guidebook experience with peers and colleagues from other universities. Her presentation on the technology at the Australasian Association of College & University Housing Officers (AACUHO) conference was the winning paper and other universities have already begun to follow in Laura’s footsteps. For Laura, there’s a great future in creating other guides to help her communicate better with students. She already has plans in the works for guides to cover global programs, summer conferences, and the student leadership program. 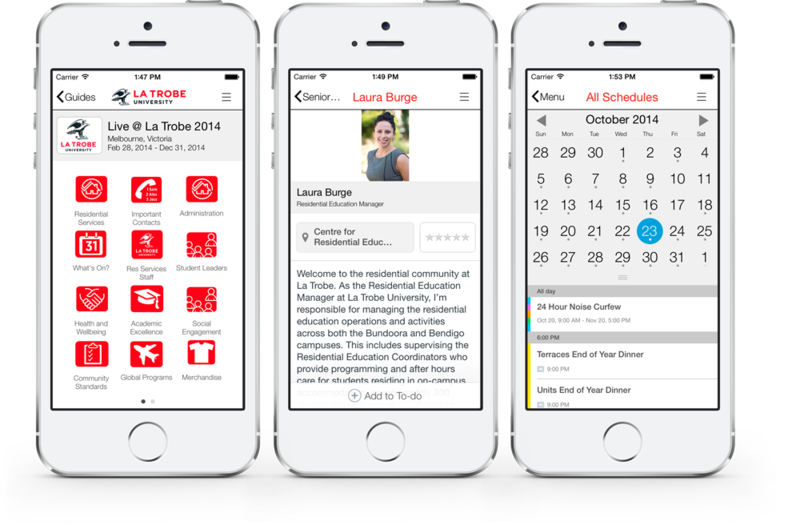 Read an article from the Association of College and University Housing Officers – International’s Talking Stick Magazine about La Trobe’s use of a an app for their residential students. 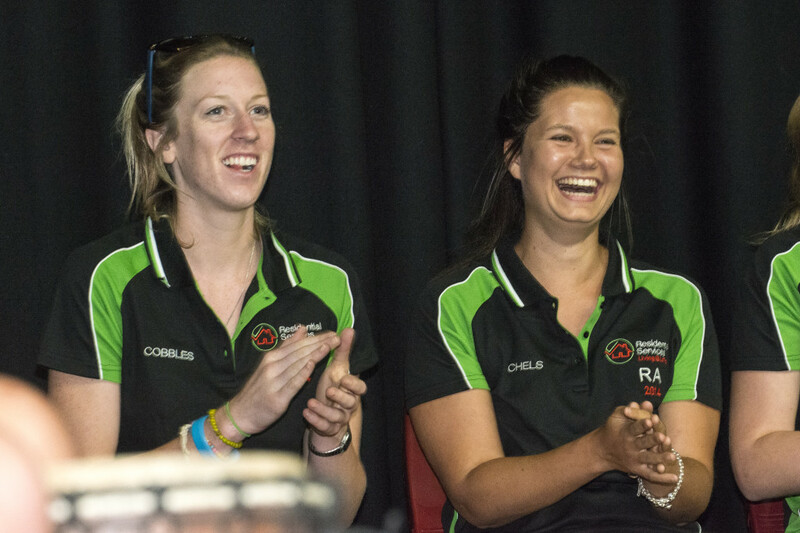 Read about how schools are using Guidebook to welcome their new students, attract sponsors and connect with their sports fans.